As the team '7am Arivu' is gearing up for an audio release on September 22, here is the details on this biggie's track list. The album consists of six tunes composed by Harris Jayaraj. 1. 'Oh Ringa Ringa...' is crooned by Roshan, Jerry John, Benny Dayal and Suchitra. Lyrics are by Pa Vijay. This is a typical Benny track as it is a fast paced number with techno beats. 2. 'Mun Andhi...' can be termed as the pick of the album, vouch those who have listened to the tracks of this film. Karthik and Megha have crooned this song that has lyrics penned by Na Muthukumar. It's a feel good romantic number that is sure to rise up the charts and set a rage among the young and those smitten by love.Take a look at these two images from the song sequence. 3. 'Yellae Lama...' is by Vijay Prakash, Karthik, Shalini and the lead lady of the film, Shruti Haasan! 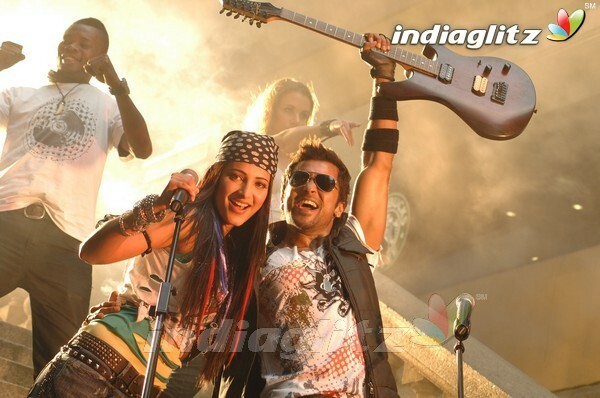 Lyrics are by Na Muthukumar and it is a duet song between Surya and Shruti Haasan, with fast and peppy beats. As you can see them in smashing rockstar avatars. 4. 'Yamma Yamma...' is crooned by SP Balasubramanyam and Swetha Menon. It's a typical pathos song that sounds more like a lullaby. The song will remind one of some of the best Ilarayaraja's melodies and sources add that SPB's voice has a refreshing and young appeal in this track. Lyrics are by Kabilan. 5. 'Innum Enna Thozha...' is by Balram, Naresh Iyer and Suchith Suresan with lyrics by Pa Vijay. The lyrics are highly motivational and are backed by apt tunes. 6. 'The Rise of Damo...' is the mandarin song sung by Hao Wang with lyrics penned by Madhan Karky. Expectations are raving high on this number by fans and movie goers. 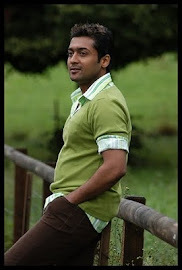 '7am Arivu' has Surya and Shruti Haasan in the lead roles under AR Murugadoss's direction. The film is gearing up for a release and it maybe mentioned that Surya - AR Murugadoss - Harris Jayaraj's earlier offering 'Ghajini' was a smashing hit.